One of the most essential tools for gutter cleaning, or pretty much any outdoor home maintenance task, is a good pair of work gloves. Along with a garden hose, a good pair of work gloves are an important tool to have around for every homeowner. There are several reasons that you will want work gloves and there are several different kinds of work gloves to choose from. Gloves can be made of several different materials and some are disposable while others are permanent and are meant to be saved. It is also important to make sure you get a pair that fit you properly. In addition, it is important that more than one person not wear the same pair of gloves. The right pair of working gloves can make all the difference in your outdoor home chores and how you feel afterward. The prices of work gloves vary quite a bit. They can cost anywhere from two dollars to forty dollars. However, you will find that even the more expensive pairs are well worth the investment. The main reason that someone would want to wear working gloves is to protect their hands. However, there are several different threats that you are protecting your hands from. Number one, many outdoor tasks have you handling items that are jagged or splintery like branches or plant debris. 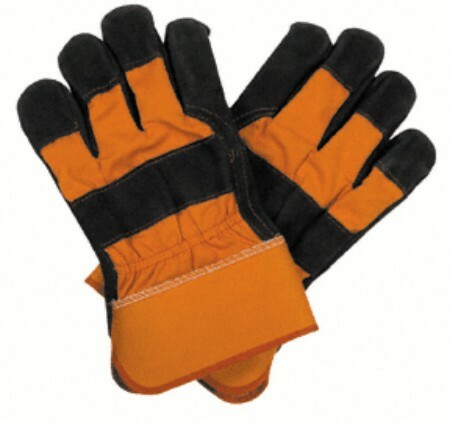 If you are wearing heavy work gloves then you will be able to handle those materials with ease. The gloves will protect your delicate hands from jabs and smalls scratches. In addition, you will be confident in your handling of those materials. If you are not wearing gloves, then you might handle a splintery piece of wood gingerly and as a result slow yourself down. If you can pick things up with the confidence that you will not get hurt, then you can continue working at a normal fast pace. Another thing you might be protecting your hands from when wearing work gloves is bacteria or mold. Many of the chores we do outdoors require that we work in wet dirt or piles of leaves and other debris that are the perfect breeding grounds for mold and other bacteria. If you touch these items with your bare hands, it is very easy to transfer them to other parts of your body and possibly infect yourself or others. If you protect your hands with work gloves then you can be sure not to get sick from coming into contact with bacteria of any kind. If you know you will be touching this type of debris, then you might consider wearing disposable work gloves so that you can just throw out the offending protective gloves when you are finished with them rather than try and wash them. Another reason you may want to wear work glove is to prevent you from getting calluses on your hands. Frequent work with the hands can cause rough spots to form on the palms of your hands and pads of your fingers. Good work gloves will protect your hands from this possibility. If you have to display your hands for your work or if you shake hands a lot you may not want calluses getting in the way so work gloves are essential. Still another reason to wear work gloves whenever you are working outdoors is that you might come into contact with something hot that could burn you without protection. For example, if you are looking at your roof and trying to decide if you need to call a roofing service to do repair work, the hot tar on teh shingles could get on your hands. The sun heats up this material to a point where it could burn you if you were not wearing protective gloves. 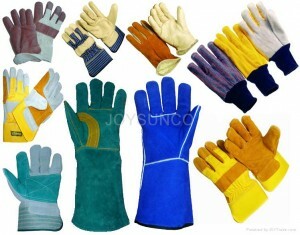 Once you have decided that working gloves are needed, you need to decide what style and material you want. Different materials offer different advantages, and there are several characteristics that may make one pair of gloves better suited for certain jobs over another pair of gloves. However, no matter what style or material you choose the idea is to get a pair of gloves that is tough and sturdy so that your hands will stay protected while you work outdoors. 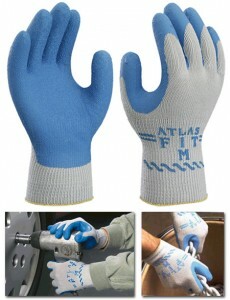 Most work gloves are made of leather, but other materials include cotton, latex, synthetic leather, nylon, and spandex. 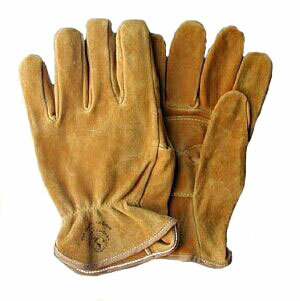 Leather work gloves are most common because leather is a very tough material and it is hard to rip or puncture. Before people made synthetic fabrics or even before they knew how to weave cotton fibers, all clothing was made of leather. It is a durable material that breathes that is insulating and warm in cold weather. Working in cold weather is best suited to a leather pair of gloves for this reason. There are not many outdoor chores to complete in the winter, but when you have to do something like change the batteries on your solar lights or clean the solar collecting panels, leather gloves are a great choice. Leather might not be the best choice if you are going to be getting your hands wet because the fabric will get stiff and will not be as comfortable afterward. Leather work gloves can be entirely made of leather, or they can have parts that are made of cotton or a synthetic fabric that is softer. If your gloves are only partially leather, then usually the palm of the glove will be leather along with the fingertips and a strip along the back of the hand where your lower knuckles are. These are the parts of gloves that take most of the beating so they need to be sturdy. Some leather work gloves slip on and flare at the wrist and others are fitted at the wrist so they are harder to get off. Almost all cotton work gloves are fitted at the wrist. They usually have a wrist that is similar to what you would find on a sweatshirt or long sleeve T-shirt. Cotton work gloves are obviously softer than the leather ones and therefore do not offer as much protection. There are some advantages such as the fact that you have more dexterity when wearing cotton work gloves as opposed to leather ones. Since the fabric is not as stiff or tough, you can do more detailed finger work. They also can get wet with little affect on their quality. In addition, cotton work gloves can be washed in a washing machine. Most homeowners use this type of working glove for gardening tasks and not heavy labor. Some cotton work gloves are coated in latex so that the palm of the glove has more grip. These are a good choice if you are going to be working with grease or oils that get slippery. You will need the added grips. Other latex work gloves are usually disposable. They come in a box with about one hundred pair and are meant for single use and then to be thrown away. I prefer to use disposable work gloves for projects where I am going to be exposed to bacteria or mold so that I never have to worry about future exposure. Gutter cleaning is a great example of where disposable work gloves would be appropriate. 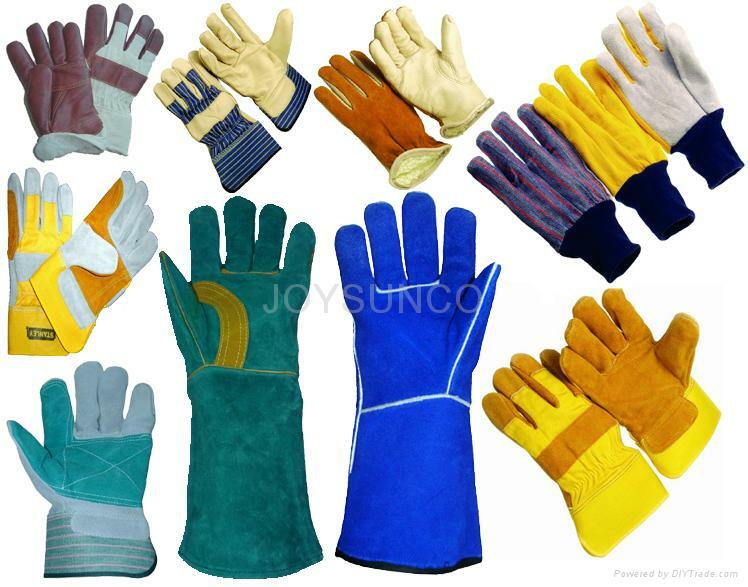 You will find work gloves in other materials such as spandex or nylon but these are not as common as leather and cotton. It is very important that you get the right size work gloves for your hands. Most styles and brands will come in five sizes so that there is sure to be one that fits you ranging from extra small to extra large. You should actually go to a store and try the gloves on to make sure you are getting the right size. 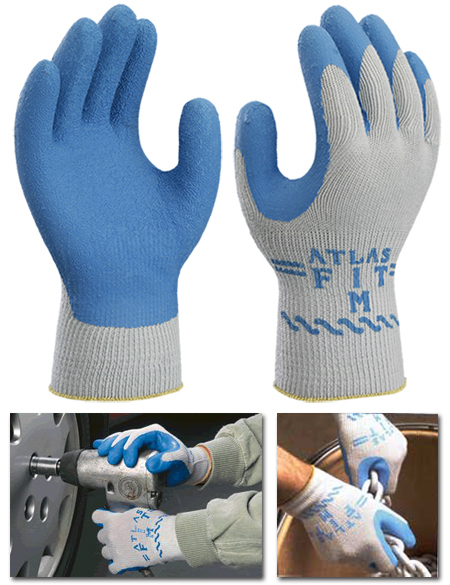 Even if you ultimately purchase your work gloves online, you should try a few pairs on. The reason it is so important for properly fitting work gloves is that the rough fabrics like leather and nylon could rub against parts of your hand and cause blisters. If the gloves are too large you will get blisters and it could be hard to handle heavy things with gloves that are constantly falling off. If your working gloves are too small, they also run the risk of falling off and your hands will not be fully protected at the bottom of your palm and wrist. A great attribute of leather is that it forms to the shape of the thing it encompasses. That means that after one person wears a pair of leather gloves a few times, they will form into the shape of their hand. For this reason, it is impractical for more than one person to share a pair of leather work gloves. Since you can get a pair fro around two dollars there is no reason that not every person in your household should have their own pair.